WizKids will release Kibble Scuffle, a tactical card game of area control based on the daily struggle of cat ladies and shelter employees everywhere. 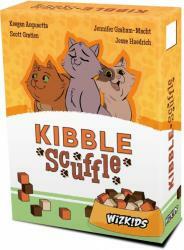 Kibble Scuffle is a game where player compete to secure the most favorable and harmonic places around the food bowls. Since all the kitties have strong personalities that can potentially clash and drive others from the feast, there is a lot of strategy involved. The Pounce Cat will remove a cat at the food bowl, the Greedy Cat snarfs up two food cubes, and the Mangy Cat forces another cat away from the bowl when it approaches. Any time there are 5 cards at a food bowl, the feeding (scoring) phase begins, followed by another round. There are tricky ways to clear places at the most desirable bowls, play the Robo-Vac or Laser Pointer on opponents� cats, distracting them from the food. Once a player reaches 20 points, the player with the most value of food cubes eaten at the end of the feeding phase is the winner. The box includes 4 player decks of 20 cards each, 5 advanced cards for each deck, 55 food cubes, and 3 food bowl tiles. The game is for 2 � 4 players, ages 14 and up, and plays in 30 minutes. WizKids announced another game this week, releasing in the spring (see �Get Bowled Over by Kaiju Combat in 'Smash City'�).